Fort Worth… beauty, elegance, culture and industry. This thriving metropolis is the perfect destination to work, play and live due to the nearby suburbs where you can make a house a home… a “dream home” that is! As you begin creating your list of items you want for your dream home don’t forget the top six amenities that are considered “must-haves” in today’s society. If your real estate agent hasn’t used this line yet, they will! Everyone knows that you can have your dream home but if it’s located near a busy highway, you’ll never get any peace and quiet; therefore, your dream turns into a nightmare quickly. As you’ve already selected Fort Worth, let’s look at the most popular area that fulfills your dream home location needs… the community of Burleson. According to the Burleson website, as of last year, the number of people who call Burleson home surpassed 43,960. This beautiful town is appealing to many because of its easy proximity to the Metroplex, its family-oriented environment, its celebrated school system, the affordability of land, its more than 28 square miles of rolling hills, lakes, picturesque parks, and it is one of the fastest growing and desirable communities in the Fort Worth area. Every dream takes place in a beautiful landscape with lush vegetation and that portrays an uncomplicated life filled with bliss. Not to mention with the great weather of Fort Worth, you’ll want to spend time in the privacy of your own backyard. Your personal retreat should be highlighted in the grounds that surrounds the home. Whether it is water fountains, a sense of privacy, or a wondrous country/suburban appeal, your outdoor environment should give you a euphoric feeling of well being. We all want to have fun at home. For those individuals wanting to entertain and enjoy time with family and friends, your dream house checklist should include a game room, swimming pool, large kitchen, dining room and comfortable family room. Just picture your home filled with laughter and good times, it will warm your heart and put a smile upon your face. Continuing to build your ideal home, let us not forget the need for an immense master suite with generous closet space, ensuite bathroom, and additional area for exercise equipment or sitting area. The master is your private oasis so the need for the perfect bedroom is an absolute must. You love your family and want them to be comfortable when they visit. At the same time, you want to ensure that you maintain your privacy so when you’re wrapping up your dream home list, think about a guest house or separate guest casita. A true chef’s delight is a must in your dream home. The kitchen is the focal point of any home. It is where people gather, share stories and prepare the daily meals. Whether it is just you and your spouse, or the whole family, this room will most definitely bring you together. If your list is complete and all six “must-haves” meet with your approval, then Supreme Auctions has the property for you. 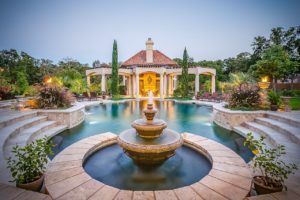 Nestled on 2.7 acres in Burleson, Texas, just 20 minutes from Fort Worth and an hour from Dallas, is Casa Incantata. This enchanted Mediterranean manor offers a private and gated utopia. Set in the private countryside amongst lush landscaping, this majestic estate provides Tuscan elegance throughout. The resort style backyard features a free-form swimming pool complete with patios and plenty of entertainment space. Casa Incantata will be offered at a luxury no-reserve auction on June 30, 2018, by Supreme Auctions. To learn more, contact Supreme Auctions at (866) 929-2243 or visit SupremeAuctions.com.